Succulents make easy to care for houseplants, and they are perfect for creating a miniature indoor garden. 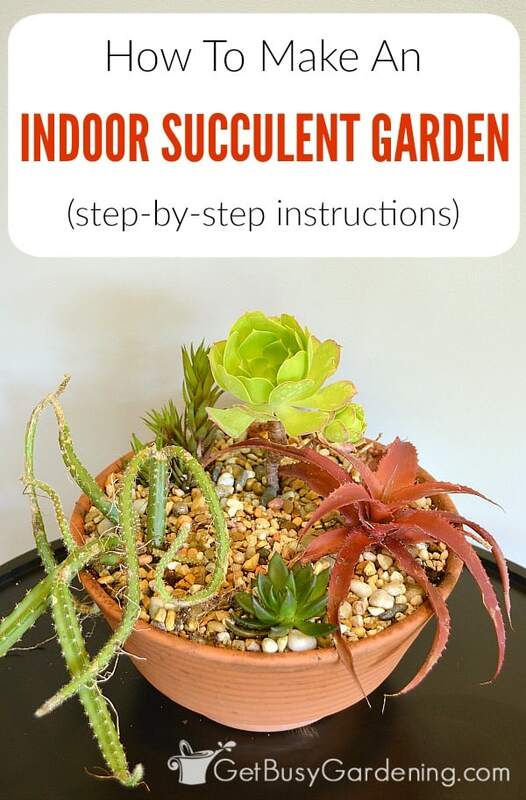 It’s fun and easy to make your own indoor succulent garden. I love combining my succulent houseplants into miniature indoor gardens! Succulents have shallow roots, so they are perfect for growing in mixed containers. 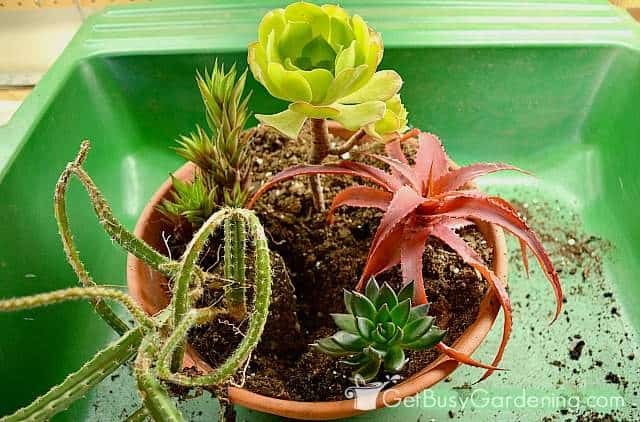 Plus, combining a bunch of small succulent plants into one container makes them easier to care for. It means less watering, and less maintenance! I’m all for making my life easier. There are tons of different types of succulent plants. They come in just about any shape, size and color. You can order succulents online, find small indoor succulent plants for sale at your local garden center, or you can use plants you already have. Heck, you could even propagate succulent cuttings from your own collection and use those. Wherever your plants come from, be sure to choose a few colorful succulents, variegated succulents, and plants that are different shapes. This helps to add tons of depth to small succulent arrangements. The number of plants you choose to grow in your succulent garden depends on what you like. You’re only limited by the size of your succulent container. To help get you started, I recommend choosing one tall succulent plant (focal plant), a couple of shorter ones (filler plants), and at least one cascading plant. The plants I’ve chosen for my indoor succulent display are: (top left to bottom right) rat tail cactus, aeonium, aloe (the red one on the right), haworthia and echeveria succulents. If you are wondering what to put succulents in, you can choose any decorative container you want for your indoor garden planter. Succulents are prone to being overwatered though (it’s the number one cause of succulent death! ), so the best planters for succulents are ones that have drainage holes. 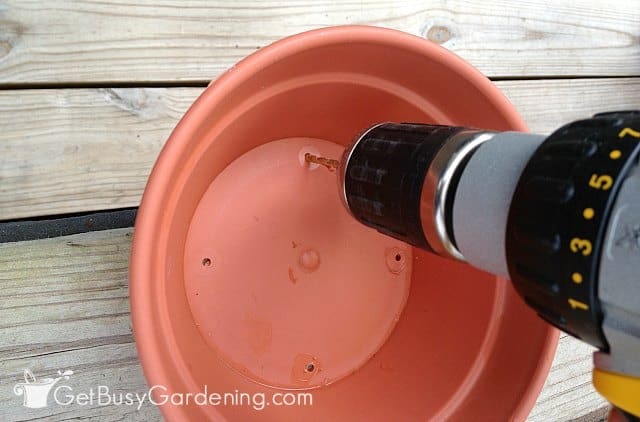 If the container you want to use doesn’t have drainage holes, you can easily drill a few holes into the bottom yourself (use a masonry bit for drilling holes in clay or ceramic pots). For this project, I chose to use a large terracotta bowl that I had on hand. Clay pots make the best succulent planters. I use them whenever I can. The reason terracotta pots are my preferred choice is because they absorb moisture, and help the soil dry out quicker. 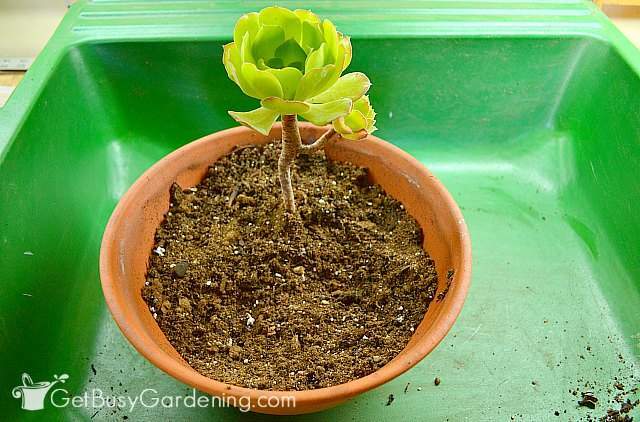 Which is very helpful for growing succulent plants, since you want the soil to dry out between waterings. 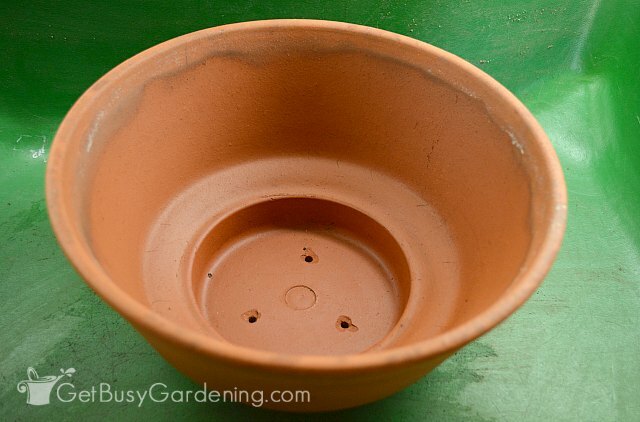 If you don’t like the look of plain pots, learn how to paint terracotta pots here. Rather than buying potting soil and decorative rock separately, you could start with a succulent planter soil kit instead, which makes creating your succulent dish garden a snap! Step 1: Cover drainage holes and add succulent soil – If the drainage holes in your succulent planter are large, then you should cover them with drainage netting before adding soil to your container. This will keep the soil from washing out of the drainage holes, but still allow the water to drain out. A piece of window screen or landscaping fabric would also work, if you have some on hand. Next, fill the container about half full with succulent potting soil. 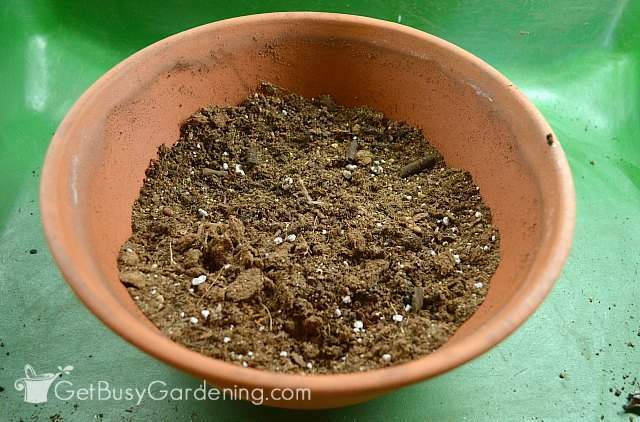 You can buy commercial potting soil, or you can make your own succulent soil using my recipe. 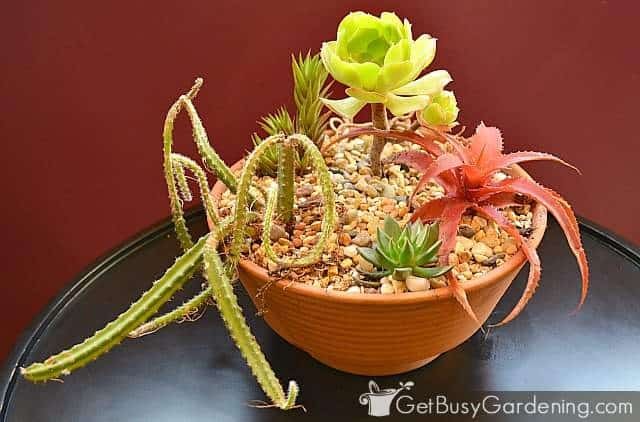 Step 2: Add your focal succulent plant – The first plant you should add to your DIY mini succulent garden is the focal plant (the tallest plant). Depending on how your succulent planter will be displayed, you can put your focal plant in the center (if it will be viewed from all sides) or, you can put it in the back of the container (if your mini garden will only be seen from the front). Tip: Instead of centering your focal plant, moving it slightly off to one side sometimes adds more interest. Step 3: Add the filler plants – After you figure out where you want your focal plant in your container, add the filler plants around it. These will be the bulk of the container so they will take up the most space. 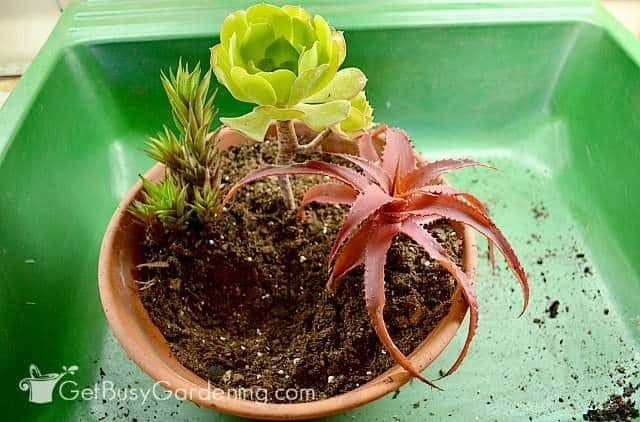 While you play around with different succulent arrangements, just set the plants on top of the soil. This will to help you figure out the best indoor succulent garden design. Nothing is permanent at this point, so moving things around until you are happy with it. Step 4: Add the cascading succulent plants – Last, add the cascading plants around the outside of your succulent planter. The cascading plants should spill out over the top of the container, adding a whole new dimension to your small succulent garden. You can add one or several cascading plants, depending on what you like, and how large your container is. 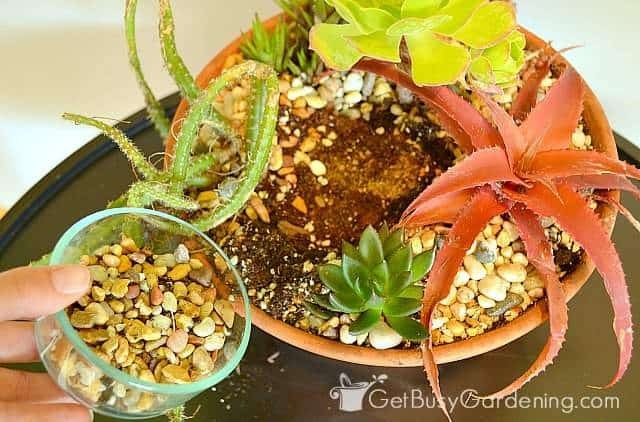 Step 5: Fill container with succulent soil – Now that you have all of your succulent plants placed in your miniature succulent garden, fill the spaces between the plants with succulent soil. Gently pack the potting soil in place as you work to fill the container. If you plan to add decorative rock to your indoor succulent garden (seen in step 6), leave about a half to one inch of space between the top of the soil and the top of the container. Water the container and allow the soil to settle. Fill in any gaps or holes that form with more succulent soil as necessary. Step 6: Add decorative rock to your dish garden (optional) – Once the potting soil has settled into the container, you can add decorative rock over the top for a nice finishing touch. I chose to use a multi-colored aquarium rock for mine, but you could use black river rock if you want to create more of an indoor zen garden. This step is totally optional, but I always add decorative rock to my indoor succulent gardens. Not only does it look nice, it helps to keep the soil from washing out when I water it. Put your succulent garden in a sunny window, succulents like to have lots of light. If the plants start to grow leggy, add an indoor garden grow light. Do not overwater succulent plants. Allow the soil to dry out between waterings. If you have issues with giving your plants the correct amount of water, I recommend getting a soil moisture gauge to make it easier. Never let your succulent planter to sit in water. Allow the excess water to drain from the plant, then dump the water from the tray the pot is sitting on. 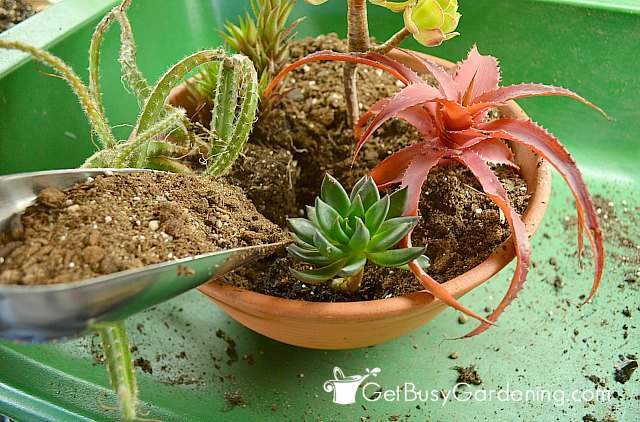 Fertilize your succulent garden with a natural, organic fertilizer. I use (and highly recommend) organic succulent fertilizer or an organic compost solution – they work better than chemical fertilizers and are much healthier for the environment. 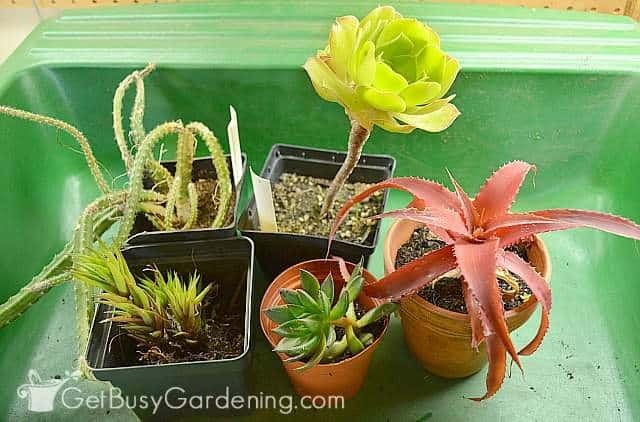 If you want to learn more about how to take care of succulent plants, read my comprehensive Succulent Plant Care Guide. Creating an indoor succulent garden is fun, and it’s a great way to display your succulent plant collection. Plus, indoor mini succulent gardens make great gifts. 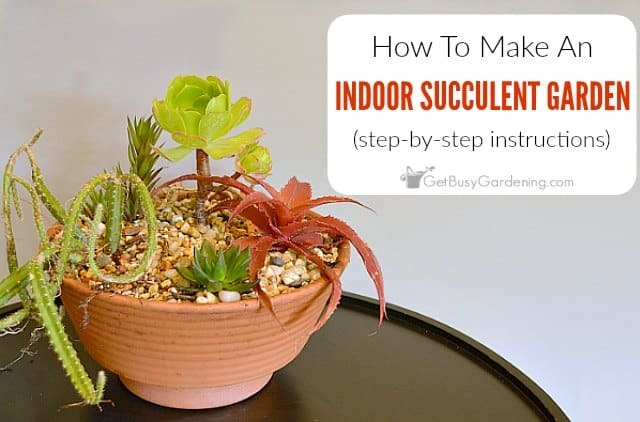 Share your tips and ideas for how to make an indoor succulent garden in the comments section below. What are the names of the plants you have used above? Great question, thanks for asking! I used rat tail cactus, aeonium, aloe, haworthia and echeveria. Also, I added the list of plants I used right above the photo of the plants. Hi Amy, your site is so informative and comprehensive! I’ve never had a green thumb but recently adopted an array of succulents from a friend who’s moving away. She grew them indoors and I’m noticing a lot of limp leaves and slouchy stalks. How should I go about making them firm and sturdy (or is slanting/slouching normal)? Also, what do you mean when a succulent gets “leggy”? Thank you, I’m glad you like my site! 😀 The description you’re giving of the succulents from your friend sounds like they are leggy to me. What that means is that, instead of staying compact and thick, they grow tall and weak because they are reaching for the light. Check out my succulent plant care guide for details about how to care for your succulents. 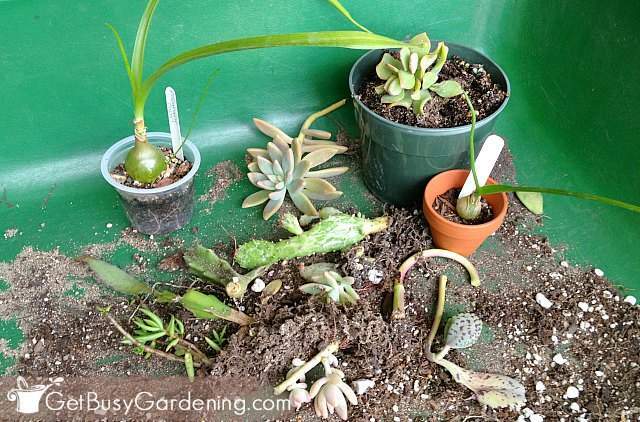 You could also try to propagate your succulents to rejuvenate the leggy ones. Good luck!